The Institute of Contemporary Development has published its monthly analytical bulletin for March. The main topics of this issue are: visits to Moscow by José Barroso and Xi Jinping; the state of US-Russia relations; the middle class in developed and developing countries; climate change on the G20 agenda. 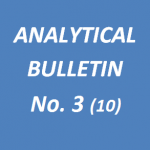 The annotation of Analytical Bulletin No.3 (10) can be found below. The full text of the bulletin in Russian can be found here. Growing public skepticism and the issue of financial support for poor countries in their efforts to deal with environmental challenges are beginning to have an ever greater impact on the policies of leading countries with regard to climate change. But “even with all the problems and low level of engagement of the international community the issue of climate change will with increasing force push itself toward the top of the agenda of international mechanism.” The G20 could make certain contribution to resolving differences and mobilizing ‘climate financing’.